Nothing announces that man is not alone as an intelligent species, and that Earth is being visited by aliens from other worlds, more than the discovery of ancient alien skulls. This knowledge is threatening to organized religions and the elite, who wish mankind to look to them as superior rather than seek contact with the visitors. Lloyd Pye has struggled to secure DNA results for his Star Child Project skull, a skull discovered in Mexico in the 1930's, and results to date indicate without doubt that the skull is not human. As this page from the Troubled Times pages state, these graphics and photos created by Lumir Janku and Robert Connolly in 1995 and 1996 demonstrate that hominoid skulls discovered in Mexico and Peru are not of terrestrial origin. We wondered why we had not seen photographs of these skulls before. Our guides explained their church leaders feel these skulls are the work of the devil, the offspring of the fallen angels in the Bible. This information has been shared by secret societies and religious leaders for hundreds of years and up until now they had decided to keep these secrets for themselves. All who first see the pictures feel "they show proof of beings from another world." It seems that these conclusions were deemed to be too shocking for the average person and that these skulls were to be dismissed as deformities and hidden far from public view. Despite release of the Skinny Bob video, a live alien who had been temporarily residing with MJ12, little progress has been made. Proof of the alien presence is in the hands of the US government, yet the cover-up over the Roswell incident continues to this day. What is the mindset of those in power that this is such a threat? Per the Zetas, alien skulls are not in the news because big egos among mankind would sputter and make a fuss. Our human heads are so small, in comparison, our brains obviously inferior! ZetaTalk Comment 8/15/1996: Denial occurs because the researchers have difficulty realizing they are not alone, not the first or most intelligent conscious species in the Universe, not the masters of all they survey. Skulls of hominoid visitors have been recovered by human researchers and documented. These discoveries never make the press, as the media find them too disturbing. There are solemn moments, hushed silences when no word is spoken. Then someone mentions that the public might be disturbed, might faint or attack the media with claims of fraud. The bones that don't get displayed are hominoid skulls that obviously have more brains than mankind, big heads that humans today don't possess, much less the heads of early man. Who wants to break this news when they would have to be faced with all those egos out there being taken down a notch! Better to keep mum, at least for the time being. Now yet another skull and skeleton has been unearthed in Peru in Cuszco. This did hit the press, though the heading still shows reluctance to admit the conclusion. Given all this undeniable proof that the alien presence is real, when the White House established a route by which the public could submit petitions, those interested in disclosure about the alien presence took heart. Surely, if they raised the requisite number of signatures, the truth about the Roswell incident would be revealed. Signatures raised, petition submitted, and response in hand. But the response was a total denial. We The People is Live! Two separate petitions submitted to the White House's "We the People" program received the requisite 5,000 signatures, ensuring a response from the Obama administration. One petition called for the "President to disclose to the American people the long withheld knowledge of government interactions with extraterrestrial beings and call for open Congressional hearings to allow the people to become aware of this subject through those whose voices have been silenced by unconstitutional secrecy oaths." The second petition was more direct, asking for the White House to "formally acknowledge an extraterrestrial presence engaging the human race." Per the Zetas, the reluctance to disclose the truth about Roswell involves more than big egos not wanting to be caught in a lie. It also involves revealing the truth about Planet X. 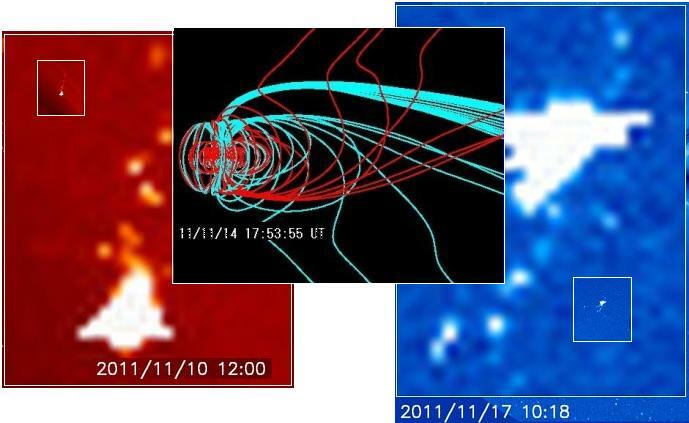 Via ZetaTalk the cover-up over the alien presence and the cover-up over Planet X are linked. ZetaTalk Comment 11/12/2011: We have stated that we do not expect disclosure to occur within the US because disclosure is tied indirectly with the cover-up over Planet X. If such a large lie were admitted, then what else are they hiding? And if aliens exist, then the highly accurate ZetaTalk might be true, and this raises questions about recent plate movements and signs in the skies seen increasingly by the populace. The elite in the US, the wealthy and politically powerful, are not ready for an enlightened populace, nor will they ever be. The people, however, know the truth, and do not need confessions to be aware. The reality of what is happening on the Sunda Plate, the tongue of the Eurasian Plate holding Indonesia, is beginning to emerge in the press. Press reports from Vietnam repeatedly mention that they are sinking into sea water. The prediction from the Zetas was for this region - Vietnam and Cambodia - to sink 40 feet, with the projection showing, in red, that the current flooded area, in blue, has almost reached the prediction. Heavy rains in the upstream and downstream in the past two days has led to Hue city submerged in sea water. By 16 hours the same day, the rain was incessant but the road is sinking in the sea. Flooding in the Mekong River Delta in southern Vietnam has caused 78 deaths, of which 65 victims were children under 16 years old. There are over 125 thousand homes and 10 thousand hectares of rice area is inundated with sea water. Where the Vietnam press and the UN are now admitting that something other than traditional rain and seasonal floods are occurring, there is still a cover-up in the press elsewhere. Jakarta is steadily sinking, with south and west Jakarta floods recently hitting the press, but these regions still have not reached the depth predicted by the Zetas, nor has the press been free to report the true status in Indonesia or Malaysia. "This year's been a freak event," said Kirsten Mildren, spokeswoman for the UN's regional Office for the Coordination of Humanitarian Affairs in Thailand. "It's not like a tsunami or a hurricane where after a couple of days the immediate crisis has ended and you're into recovery. Here, you're weeks or months in water and it just keeps escalating." ZetaTalk Prediction 10/22/2011: The world is beginning to take notice, despite the blackout and excuses provided by the cover-up artists. Where this all seems to be taking place gradually, sudden acceleration can occur. Do not be lulled by seeming delays. Indonesia has brutally suppressed any independent journalism reporting on the stagnant floods in their country, as has Malaysia. ZetaTalk Prediction 2/19/2011: The 7 of 10 sinking will flood the tip of Vietnam south of Ho Chi Minh City, and a strip of land just to the north of Phnom Penh in Cambodia, and the area around Bangkok in Thailand. The S America roll is a 7 of 10 scenario whereby the top portion of S America rolls to the west, pushing the Caribbean Plate down as it does so. As this progresses, the east coast of S America is pulled apart, the continent bowing. ZetaTalk Analysis 1/15/2011: For the top portion of S America to roll to the west, something must thus give, and to some extent this is the southeastern portion of S America. There is already a seaway developing at Buenos Aires. For S America to be pulled in a bow like this, the land is stretched. The Zetas were asked about a new crop circle in Ipuacu, Santa Catarina, Brasil and described it as depicting the S American bow. Is this in process? Buenos Aires certainly seems to have more than its share of water main breaks and collapsing buildings and docks! The mayor of Buenos Aires has announced that the city bank will value those properties affected by the building collapse in Balvanera so that money can be given to the residents to buy similar apartments to the ones they lost. A section of the dock of bridge Ibicuy, located in the province of Entre Rios, Argentina. In the last hours a large portion of this areas of the pier collapsed and dragged the waters of the Parana two people, an unspecified number of cranes, a tanker loaded with 34, 000 liters of fuel and a truck. A water main pipe broke at early this morning and thousands of gallons of water flooded Salguero street, which left more than 20 inches of water on the sidewalks. 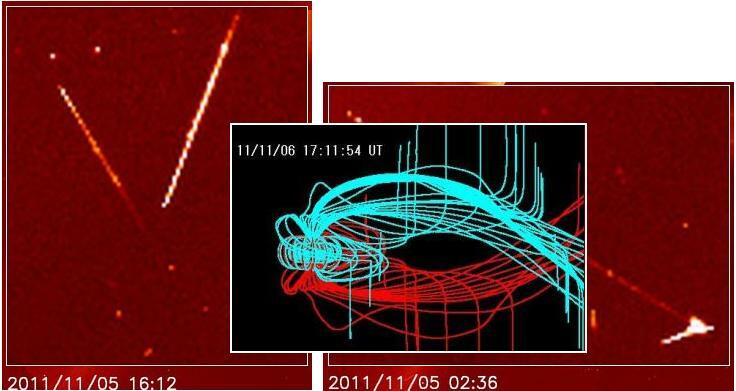 On an almost daily basis, evidence of Planet X appears on the SOHO and Stereo images and the Magnetic Simulator graphs. All this is documented by a devoted crew at the Pole Shift ning. The normal wings of the Earth's magnetosphere, blown back by the solar wind, are twisted and reversed, showing the presence of the powerful blast of magnetons from the N Pole of Planet X, which is rapidly approaching Earth. The Moon Swirls of Planet X, and Planet X itself, are visible, along with a trailing tail. Planet X often takes the form of a Winged Globe. One of the Moon Swirls is termed the Check Mark, because two tubes of swirling minor moons trail off on either side of the dominant moon. Despite all attempts to dissuade the public that evidence of Planet X exists, or to give an alternate explanation, NASA fails. In the past NASA has allowed its archives to be altered with cut-and-paste so it appears the Winged Globe has been around well before 2003, as documented in Issue 170 of this newsletter. NASA claimed that captures of the Winged Globe or the Moon Swirls on SOHO are exploding asteroids, as documented in Issue 202 of this newsletter. NASA used an eraser to attempt to get rid of the evidence, as documented in Issue 204 of this newsletter. And NASA claimed Planet X was a CME, as documented in Issue 216 of this newsletter. But the beat goes on, and the evidence getting harder and harder to hide or explain.